I’m meandering my way through several books at once, as usual, but my top priority right now is to finish The Merchant of Venice. It’s such a tight, efficient play. I remembered Act II as really long, mainly because it has nine scenes (I used to teach this play to high school sophomores; I know these things), but it moves along at a rapid clip. It’s actually a short play with a lot of ideas packed into it. I just read the scene in which the Prince of Morocco came to play the guess-the-casket game that will determine Portia’s husband, and it’s full of imagery that aligns the Prince of Morocco with Shylock. I know I will enjoy reading the rest of the play when I actually sit down and do it, and I am also looking forward to Howard Jacobson’s Shylock is My Name. Also included in the photo is my current planner book and a 2014 issue of San Francisco magazine – NOT because I’m two years behind in my periodical reading (I promise!) but because I use it as a surface when I hand-write on paper on the dining room table. I had almost a whole skein of the bright orange yarn left over, so over the weekend I cast on a scarf. I’ll need more in order to finish the scarf, of course, but I won’t mind a dye-lot line in a scarf – and I really, really want to keep working with this yarn. It’s so bright and thick and soft. That yarn is lovely and the color is amazing!!! I don’t blame you for wanting to keep knitting with that yarn. It’s such a beautiful color and it looks real soft. 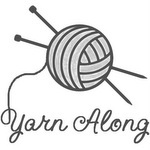 Gorgeous yarn and an interesting read!! After winter, it’s always nice to have bright colors! I’m knitting with orange right now, too. Oh I love the merchant of Venice! Have you seen the Jeremy Irons/Al Pacino production? Love it! That pattern suits the scrummy orange yarn very well, enjoy! Thanks! And no, I don’t think I’ve seen any film adaptation of the play. But Irons/Pacino sounds great!